You'll Earn 45 Loyalty Points! 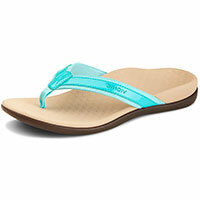 The women's Tide II sandal footbed runs large. For half sizes, we recommend sizing down. I need to wear orthotics so it is a dream to find sandals with built-in support. They are so comfortable and my feet don''''t ache at the end of the day. This is exactly what I wanted in a shoe with an arch support! It looks good. Particularly helpful was the advice about ordering a half size smaller than usual. They fit perfectly. I wear an 8.5-9.0 U.S. and needed the size 7! Fits perfectly. Own many of these sandals and love them. I LOVE these!!! This is my 3rd pair and I wear them everyday!!! My foot issues are resolved with these shoes!! I even wore them yesterday for a Boy Scout Hike!! They were perfect!! 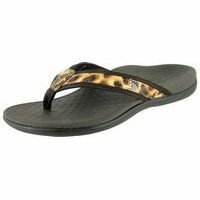 I love in flip flops and these are marvelous!! Feel so good and fantastic arch support! My plantar fasciitis is well under control now!! I''''m very happy with these sandals. I have inserts in my tennis shoes, but who wants to wear those with a swimsuit?? Love these thongs, at first I didn''''t like the pink color on the internet, but when I received them they were patent leather lipstick pink, I just love them. They keep my posture straight. I''''m so excited to have something fun to wear. I''''m very limited in shoes to wear and live in Orthaheel/Vionic thongs. Love em! I was so impressed with the short delivery time and quality of the product. I would definitely recommend this product to a friend. This is my first pair of Tides since the switchover to Vionic. These run bigger than the Orthaheel or at least this pair does. The foot bed feels more flimsy as well. The arch doesn''''t seems as thick anymore either. 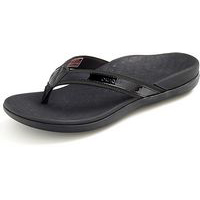 I love Tide II flip flops...I even where them with thong sandals in the winter!They are the most all around comfortable flip-flops I have ever found. Hooray for Orthoheel/Vionic!!!! Love, love, love my Orthoheels! I can''''t believe how fast and efficient ordering was.WOW. The website was easy to navigate and even easier to order. And So Fast!!! And Free Shipping! What''''s not to like! ?! 1st time buyer - read all previous reviews and had to try for myself. Love the product. Will definitely buy more! I love these flip flops. This is my third pair and I find them more comfortable than my custom made orthotics that I wear in my running shoes! 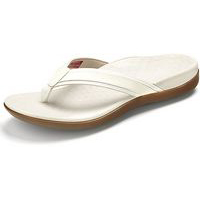 I just purchased the Vionic sandals in 3 colors they are very comfortable and as I have not yet worn them because it''''s too cold I am looking forward to wearing them . I have a lot of problems with my feet and they will help a lot. 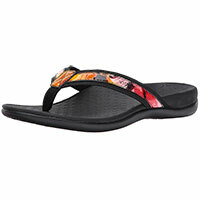 This is my second pair of Tide Sandals. Because of plantar fasciitis I needed flip flops with arch support. Saw these were on sale so I added another color to my flip flop wardrobe. I have owned several pair of orthaheel flip flops for years. These Vionic brand flip flops are way too narrow and shorter than my normal size. Be sure to adjust size before ordering. Could never wear flip flops before! This is my third pair of flip flops from Orthaheel/vionic and I love them. 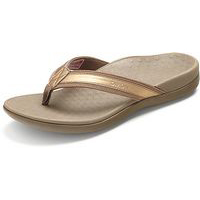 Only sandals that are comfortable after severe Plantar Fasciitis. 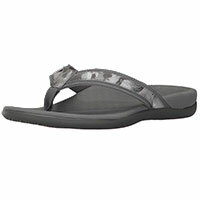 Have been enjoying by comfy sandals, will be ordering more colors. They are definitely wider than most sandals which was a plus for me. 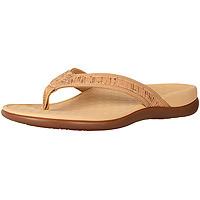 Purchased about a month ago and have worn them everyday they are so comfortable, arch support is perfect. I have had pain in heel with flip flops but I am pain free with these. Great fit and comfortable too! Just received my Vionic sandals today. I normally wear an 8 so I purchased an 8 and I couldn''''t ask for a better fit. Arch provides great support. I''''m sure I will be back to order a different style and color! Love them. When I first bought these I thought I would return them because they felt weird but give them a chance these are my third pair and I am really pleased with the way they feel. Q: WHAT IS THE HEEL HEIGHT OF THE TIDE II ? A: The heel height is 1/4 inch. Q: I normally wear a wide shoe . Would this sandal work for me? 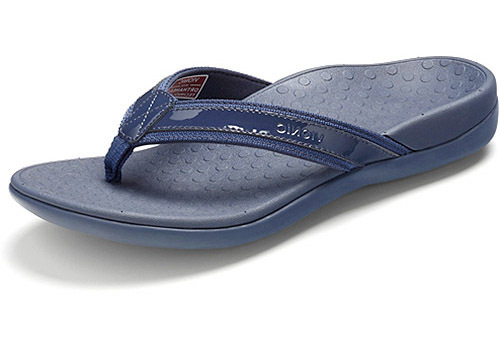 A: The Vionic Tide II fits medium to wide feet. Q: Do our sandals come in narrow? A: The Tide II is currently offered in medium widths only. woven/leather uppers, padded neoprene upper liner, EVA footbed, TPR outsole.